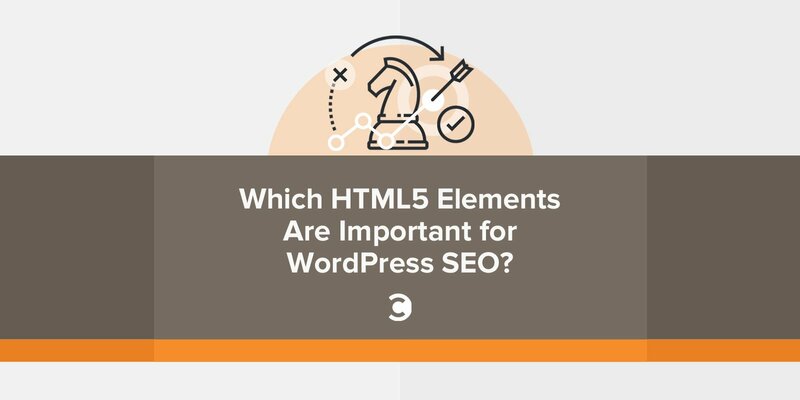 Which HTML5 Elements Are Important for WordPress SEO? HTML5, the most recent HTML version, has been around for a few years now (though it was the first major HTML update in 14 years). 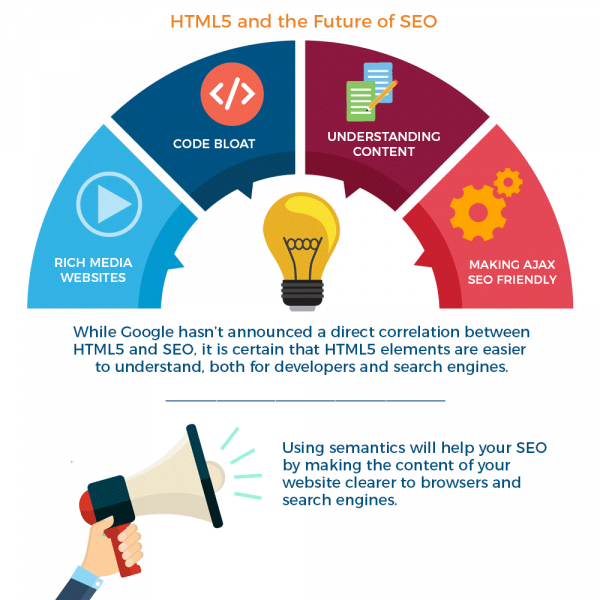 However, there are still some mysteries about how it differs from previous HTML versions as well as some misconceptions about how HTML5 elements impact SEO. If you use a CMS tool like WordPress, it’s important to understand that their standard themes are not an out-of-the-box solution for SEO and HTML5. For best SEO results, you will either need to develop your own HTML5 theme or edit an HTML5 theme that someone else has created. 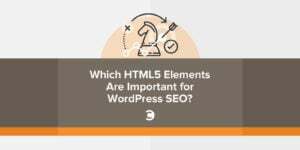 In the content below, we will go over HTML5 elements and why using them in your WordPress theme is important for SEO. These sorts of tags gave no real indication of what the content is, which could make things confusing both for developers and search engines. 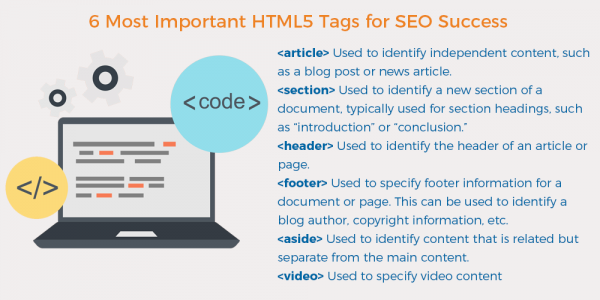 HTML5, on the other hand, uses semantic elements—easy to identify tags that clearly describe different parts of a web page. <header> Used to identify the header of an article or page. <footer> Used to specify footer information for a document or page. This can be used to identify a blog author, copyright information, etc. <article> Used to identify independent content, such as a blog post or news article. <figure> Used to give written context to images on the page. <figcaption> Used to give a caption or explanation of an image. <nav> Used to indicate major links to search engines. This should not be used for every link on your site. <time> Used to specify the time that something was posted, such as a blog post. <main> Used to identify the main body of content on a page. <mark> Used to indicate a highlighted or specially marked passages. <summary> Used to provide a visible summary of the content for the user. It is used in conjunction with the <details>. When the summary is clicked, additional hidden information or content place inside the <details> element becomes visible. With previous HTML versions, developers could use their own definitions for page sections, and the inconsistency could make it more difficult for search engines. However, HTML5 uses standard semantic elements, which makes it easier for search engines to identify different sections of your webpage. This is one reason why using HTML5 elements in your WordPress theme is very important for on-page SEO. Additionally, using HTML5 rich content means that there’s no need for external plugins like Flash to play audio or video. 1. Your images and videos will be more searchable. It’s cool enough that HTML5 makes the sections of your page more clearly organized, but did you know that it also has the power to make your images and videos more visible as well? Using <figure> and <figcaption> or <caption> and <subtitle> tags allows you to explain these elements to search engines. This helps search engines better identify and index your images and videos so that they appear in relevant searches. 2. You can determine page rank priority. In the past, there wasn’t really a way to let Google and other search engines know which navigation links should take priority in search engine results. With HTML5, you can use the <nav> tag to let web crawlers know that that internal link should have priority over others. This way, your main navigation pages will have better ranking. 3. You have more control. Using HTML5 means that you can change any detail of your site just by adjusting part of the code. Even if you’re using someone else’s HTML5 template instead of creating your own, an HTML5 template is much easier to adjust than a regular WordPress theme. Plus, with an HTML5 template, you can pick and choose which features to include instead of having a bunch of extras that you don’t use. Eliminating unnecessary and extraneous pages can also have a positive impact on SEO. 4. It’s relatively simple to use and understand. Even if you’re not a coding nerd, HTML5 is built to be more legible, both for you and for search engines. Now that you have a better understanding of why HTML5 is important for SEO, you can select or start developing an HTML5 WordPress theme. While Google still hasn’t made any clear announcements that HTML5 is given any sort of priority when it comes to SEO, they also haven’t given any evidence to the contrary. And, given their history over the last 18 years, it stands to reason they will continue to evolve with current trends.